Not even the withdrawal of both our first choice as race officer, Josh Kruyt due to work commitments and our protest chair prevented the 2019 Hobie 14 nationals from taking place. We were extremely fortunate when Craig Leslie stepped in to be Race Officer on Saturday and Di Hutton Squire took over for Sunday and Monday. A desperate search for a committee boat resulted in Gert Bruwer providing a superb yacht in the form of his Dix 43 with its flush deck gave us the best committee boat that we have had for many a year. Gert was hospitality itself to the bridge crew – much appreciated Gert. Luke Scott took over as protest chair on the understanding that he could do it via Skype which we accepted with some reservations but after all there was hardly likely to be a protest in the Hobie 14 fleet !!! Craig Leslie coped superbly with factors of the strange Hobie courses, a different venue and the volunteer bridge crew, Maryke, Caroline H, Nicola and on Monday Julie Ellway and knocked off five races on the Saturday after only starting after 1 PM. We could only muster two rescue/mark laying boat’s – many thanks to Rob Selig and Zander van Aswegen who did a sterling job. 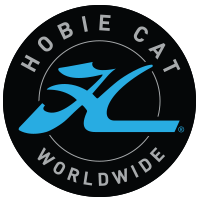 Rob’s knowledge of Hobie sailing and Hobie courses was invaluable and both race officers commented that they would like to have his services at their disposal for future regattas. With five races in the bag and a regatta confirmed all on day one it made things much easier for the following two days. It became clear from race one that it was likely to be a two horse race. Hein de Jamaer got five bullets, or he thought he got five bullets but he turned out to be OCS in the first race which as it turned out may have cost him the regatta or at least a joint 1st place. Blaine Dodds thus took first place in race one and was runner-up in the other four races. It was good to see Richard Ayres and Paul Lagesse come out to play, Paul having borrowed a boat for the event and showing that he is still a force to be reckoned with on a Hobie 14. The wind started off at about 5 knots out of the north swinging to north-west and then to Westerly and building through the afternoon to about 15 knots which made wonderful sailing especially on Langebaan Lagoon. There was a lot less wind on Sunday and we waited until after lunch before we launched. That man Dodds started to come into his own with first places in races 6 & 7. A quick look at the score sheet shows that he got a 10th place in race 8. The reason for this became apparent when that unheard-of event a protest in the Hobie 14 fleet was handed in by none other than Mr Dodds himself against second placed Hein. That Skype connection would become necessary after all. Blaine was given an extended period to submit his protest as he had damaged his right leg in a pitch poll capsize trying to avoid Mr de Jamaer. We agreed with Luke that the protest would be heard at 8.30am the next morning and Matthew Gray who just happen to be in the right place at the right time was co-opted on to the protest committee. Thanks Matthew your help was invaluable. It was a very interesting exercise for all concerned as Hein and Blaine had been coming into the mark on port both out on trapeze when Hein hardened up to round the mark, hitting it in the process and falling off. Blaine thought he was going to tack, indeed the whole point of Blaine’s protest was that Hein thought he was entitled to tack and said so on numerous occasions. The protest was heard but was dismissed on the basis that in no actual tack took place. The most important point being the footnote that you cannot just tack in front of somebody as you go around a mark. Look up the case histories on the Internet in particular case history #15 which Luke drew our attention to. The running of a protest meeting on Skype, well actually FaceTime Video, was a great success and certainly cuts down travelling time and costs. By Monday, 18 March we had done nine races with a possible three more to do with a cut-off time of 3pm. There was precious little wind on Monday morning and lots of Hobie friendships were renewed while we waited. The beach at Langebaan and the Hobie shop just behind the parking proving an ideal venue – thank you very much to Hobie Cape for accommodating us. Racing eventually got underway in a very light southerly at about 1 o’clock. Hein and Blaine were really the only two who were in contention with Richard Ayres waiting to pick up any pieces. From further back in the fleet it was fascinating to watch Hein and Blaine have a real dingdong match racing scrap. When it came to start time they had taken each other halfway up the first beat and in the last race they were certainly both last over the line, yet such was their boat speed that they came back to be 1 & 2 in race 10 and made up places to be 7 & 8 in race 11. If only I could sail like that ! We ran out of time to hold race 12. Prize-giving was held at the Hobie shop – Blaine (Rodger Federer of the Sailing world) collecting the Hobie 14 national trophy ( that he had brought to the event) for the 16th time I think it is. Runner-up Hein sailed superbly with Richard Ayres getting the bronze medal. Graham Offord on his R 3000 Hobie 14 showed he is a force to be reckoned with coming fifth ahead of Rob Fine in his new R125,000 boat ! Wayne Smith was the only competitor from out-of-town who very kindly came all the way from Durban to sail in Rob’s old 14 and came very close to beating him. 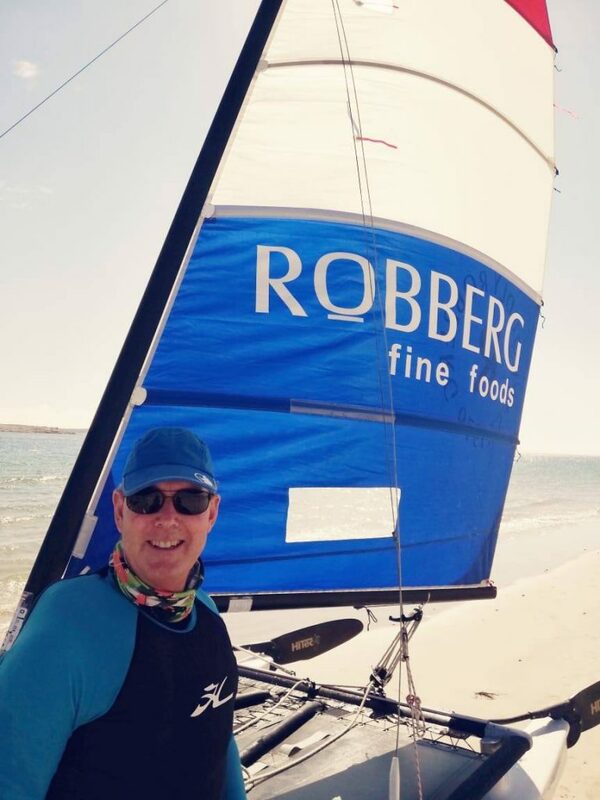 Simon Russell while from Joburg is not technically from Gauteng sailing wise as he does most of his sailing in Langebaan, came eighth with the evergreen Klaas de Rooy, watched over by his son-in-law Zander van Aswegen in the rescue boat came 9th. Jack Hartland and Hennie de Villiers had a battle for 11th spot Hennie unfortunately not been able to sail on the Monday added to his total of points. First lady home was Shannon du Plessis in 13th place ahead of Matthew Gray and Jim Cairns who both braved the long journey north from Fishhoek ! Alex Russell was the first junior in 16th spot, some of his results being worse than they should have been due to being late for the start which may just have been as a result of having a girlfriend in the area. Deon Jeannes and Dave Power could not sail all the races, Dave coming back from a boat breaking up underneath him and having to put together a replacement boat. It was good to see Charles Rickens on a 14 but unfortunately he found out that they are far more dangerous than Tigers and broke a rib on the first day to retire gracefully after race 3. I think it is fair to say that a good time was had by all and Langebaan is a superb sailing venue. The only disappointing aspect was the lack of support from Gauteng and KZN Hobie 14 sailors. We could have easily got 30 to 40 boats on the water.